The following two scripts work together. The first extends an existing quest script and runs functions to calculate if certain quest objectives should be displayed as completed or not. The second script is attached to the player for the duration of the quest and creates the functions that are called by the first script. 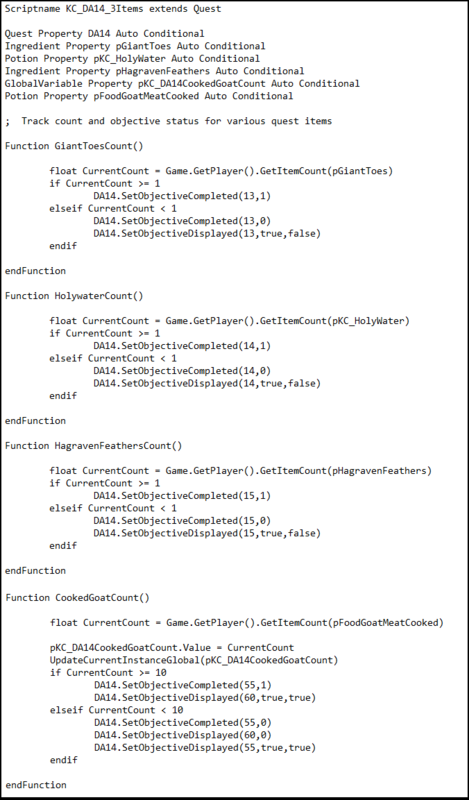 These two scripts, working together, will detect if specific objects are added or removed from the players inventory. This allows the quest to accurately track if the player has specific items and display that tracking to the player in the form of quest objectives! Very cool, right! ?